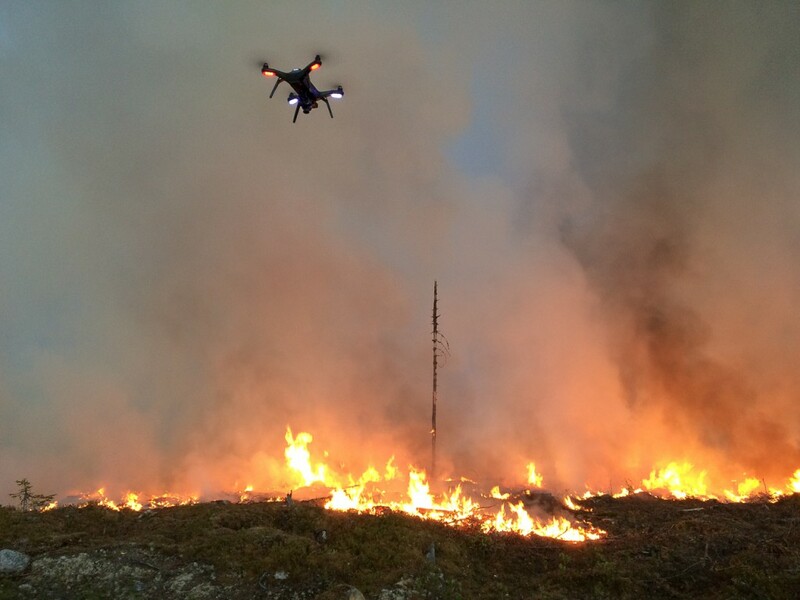 3DR Solo, equipped with Flir Vue and GoPro over prescribed fire. 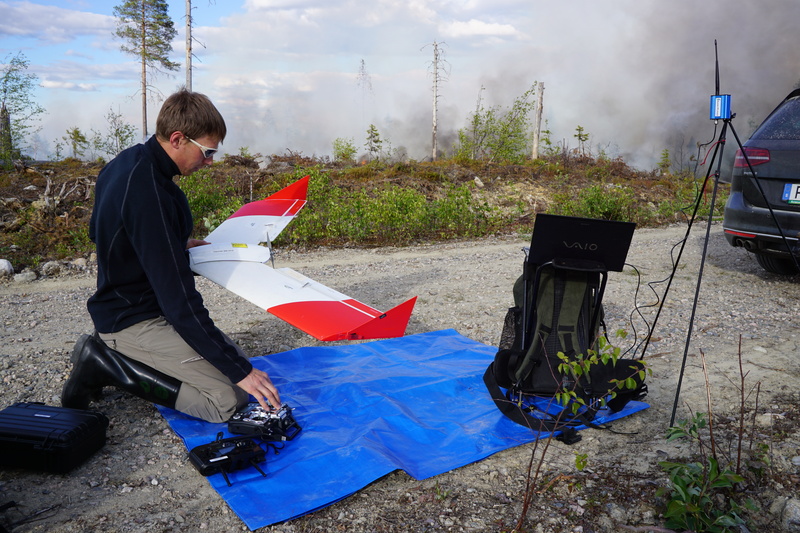 The scientists at the Ljungberg Lab at the Swedish University of agricultural Sciences in Umeå went for a two day field excursion to test thermal cameras and new drones. Joining the students at the Fire Management course at the Forest faculty, who were going to make a prescribed burning of a 20 ha clear-cut. 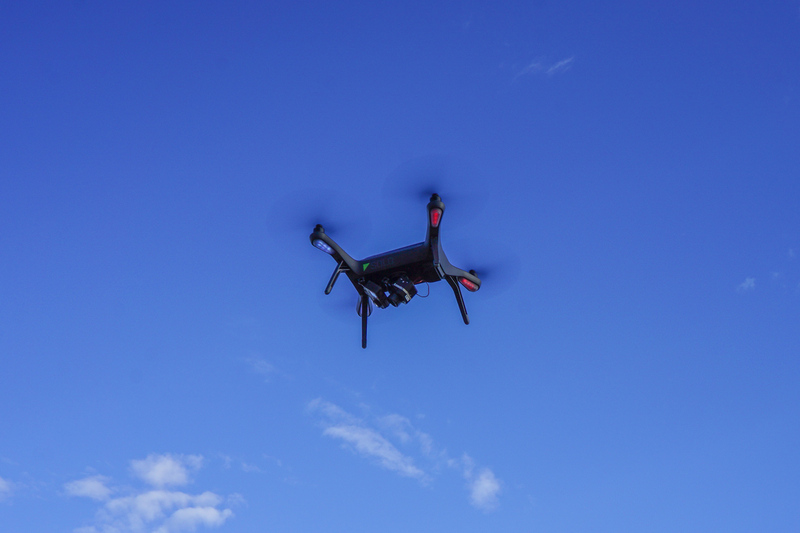 We wanted to test our new Solo helicopter drone from 3Drobotics and to capture thermal video and images from our Flir Vue camera. We also wanted to test the thermal camera in our fixed wing Smartplane drone. 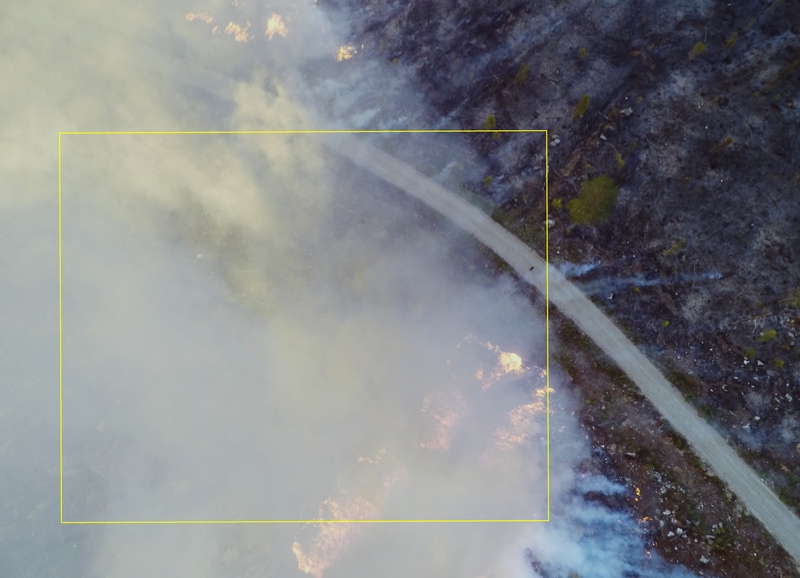 We started by capturing RGB images from 200 meters above ground with the Smartplane before the fire was started. 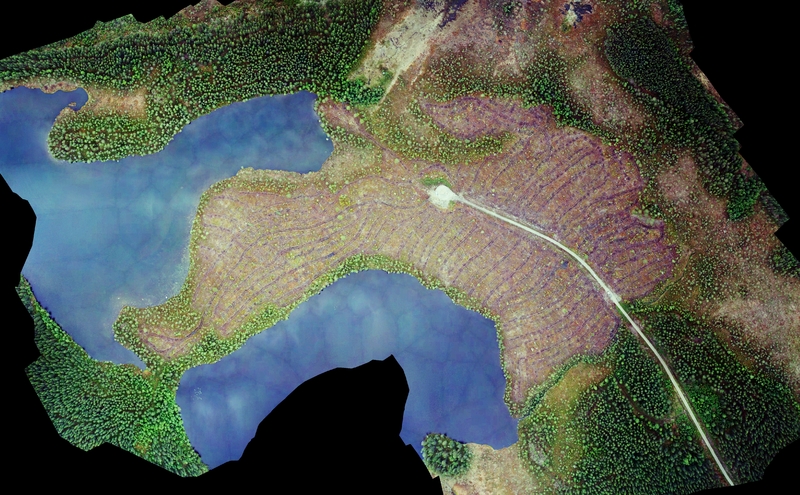 From this imagery we created a 7 cm Ground Sampling Distance (GSD) orthorectified image mosaic. Which could be used for describing the pre-fire state of the area. 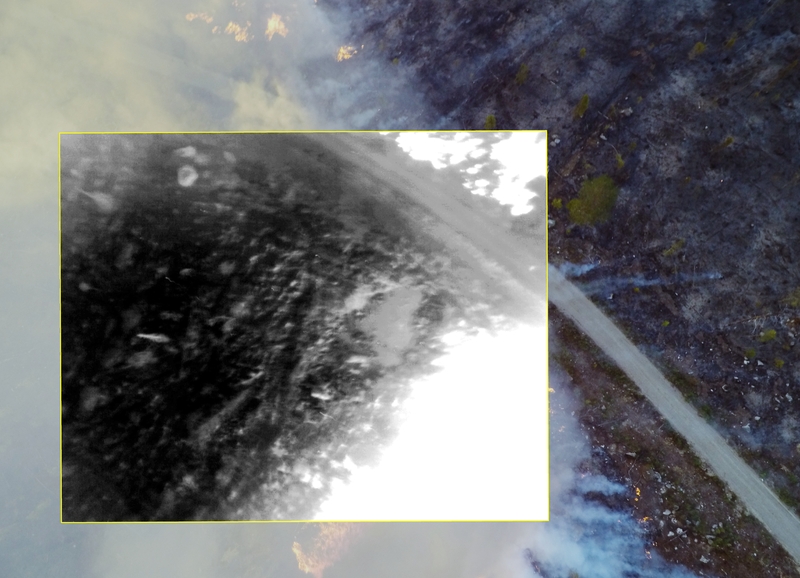 We started by capturing video with both visual (GoPro, with modified lens) and thermal video (Flir Vue Pro 13mm 640×480) of the controlled burning (prescribed) of the clear-cut. 3DR Solo with GoPro and Flir Vue Pro, the cameras are tilted forward to acquire oblique video. 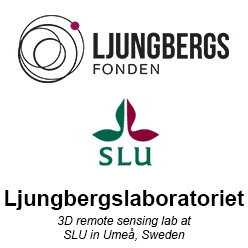 The video streams were later synchronized and fused to a side-by-side video using a software made by engineering students (an earlier project at the Ljungberg Lab). Under the duration of the controlled burning we flew the thermal camera multiple times, with the purpose of acquiring aerial thermal and visual (RGB) images to describe the burn process and to test the usefulness of having a thermal camera to find hotspots or ground fire hours after the fire front have passed an area. 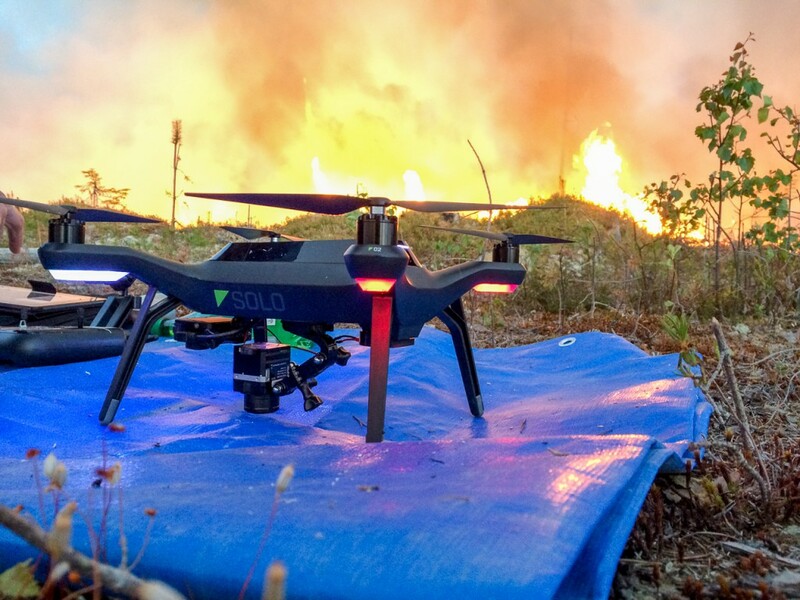 3DR Solo ready to photograph controlled burning with thermal (Flir Vue) and visual (GoPro) cameras. Smartplane ready to be launched for thermal mapping. This will be evaluated later, when all data sets had been processed to orthorectified imagery and also to 3D point clouds. An image taken with a GoPro camera from 80 meters altitude. The yellow border shows the extent of the thermal camera. Note the person walking on the road. Same as above, but a thermal image overlaid. White color is warm and black is cold. Note the hot area on the right side of the road which only can be seen in the thermal image. An image taken with a GoPro camera from 80 meters altitude. 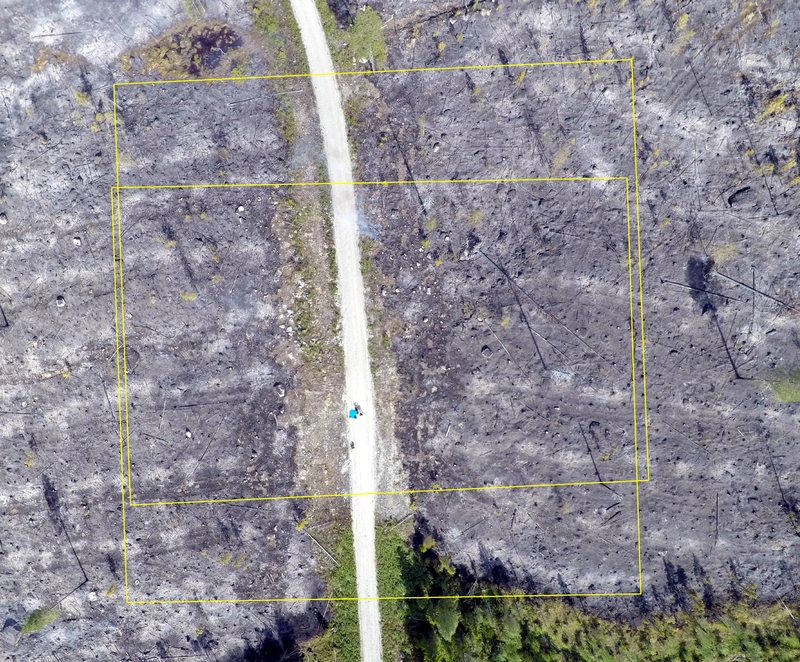 The yellow border shows the extent of two thermal images. 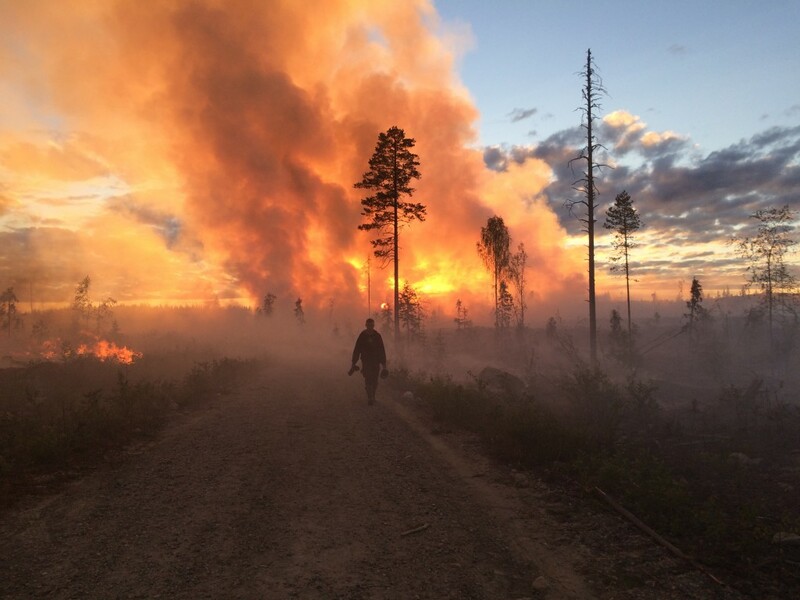 These images were taken about 12 hours after the fire front had passed the area. Same as above, but two thermal image overlaid. White color is warm and black is cold. 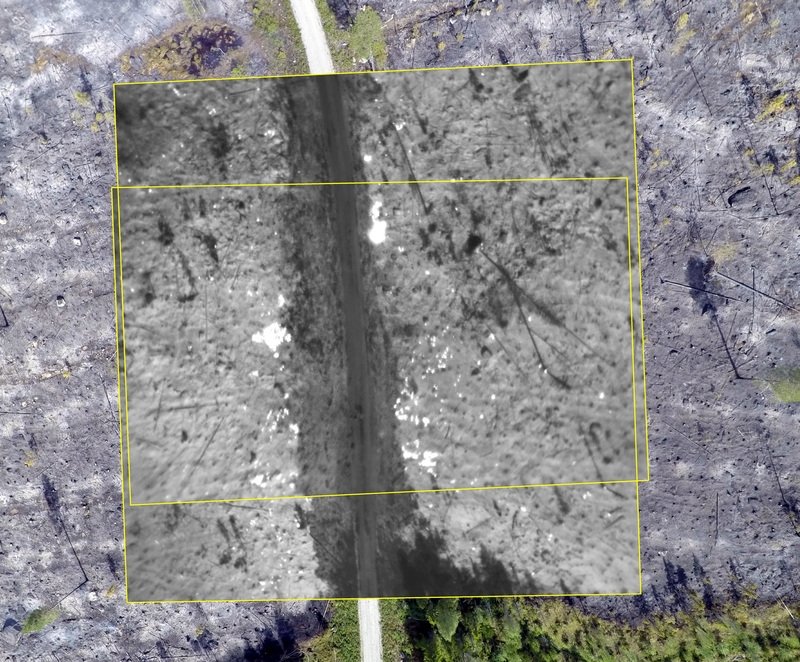 Note the hot spots on both side on the road only seen in the thermal images. Next Next post: Parrot Sequoia arrived!